Two weeks ago, on the forum of the James Randi Educational Foundation (JREF) a Brazilian "Revisionist" posting under the name "Snake Tongue" launched what he apparently considered to be a major attack on my mass grave capacity calculations in Chapter 7 of the HC critique of Mattogno, Graf and Kues. "Snake Tongue" was obviously so proud of his achievement that he also posted it on the "CODOH Revisionist Forum". After Nick Terry called my attention to this gentleman earlier this week, I responded to "Snake Tongue" in my first posts on the JREF forum, posts nos. 2239, 2256, 2258 and 2259 of the "General Holocaust Denial Discussion Part II" thread. The average body volume of 2 adults and 1 child is 0.07158 cubic meters. Thus a 21,310 cubic meters burial pit would hold up to 297,713 bodies of adults and children with an average weight of 34 kilograms. The "misused" nonsense aside (as I pointed out in JREF post 2256, I had not based my calculations on Provan's experiment but applied the same calculation method as "Revisionist" guru Carlo Mattogno), I noticed and pointed out a conspicous oddity in ST's calculation results: while ST claimed that no more than 14 people with an average weight of 34 kilograms could be squeezed into one cubic meter, Charles Provan had managed to squeeze 8 people with an average weight of 33.25 kg into 0.44 cubic meters, which is the equivalent of 18 people per cubic meter (and there would have been room for more if test subjects had been dead and not needed to breathe). What could explain so large a difference in concentration (14 vs. 18 per cubic meters) despite a low difference in average weight (34 vs. 33.25 kg)? How could it be that the bodies of Provan's test group occupied less volume on average than those of the hypothetical test group with 3 adults à 43 kg and 5 children à 16 kg, even though the total and average weights of the latter test group were lower than those of the former? b) double the weights (86 kg for adults, 32 kg for children). As I confirmed by further calculations applying the same random factors to the adult and child weight values, it doesn't matter whether you double the weights, cut them in half or multiply them by or divide them through any given factor. As long as you use the same multiplier or divider for both and the relation between adult weight and child weight is not changed, the average volume occupied by one person in the test group will always be 0.052632 m³, and the concentration of bodies per cubic meter will always be 19. This, of course, means that ST's calculations are deeply flawed, to put it politely. Why is that ST's formula leads to such obviously mistaken results? Where did he mess up? Concerning your question. The quick answer - the author uses the same volume, 0.44 cubic meters, for Provan's test group (175+85+7 = 266 kg) and Holocaust Controversies group (3*43 + 4*16 + 16 = 209 kg), while it is obvious that the latter group can be placed in a smaller box. Provan's box had a volume of 21 x 21 x 60.5 = 26,680.50 cubic inches or 0.44 cubic meters. He placed where 3 adults (174 kg), 4 children (85 kg) and 1 doll (7 kg). In all calculations of such kind we make implicit assumption that there is proportionality between the volume necessary to accommodate one body in a grave V and the body mass M. I.e., for example, if we need 0.2 cubic meters to accommodate 100kg person, then 0.02 m^3 is necessary to accommodate 10kg child. This assumption is not perfect, but otherwise we cannot move forward. Now the author calculates necessary volumes for different bodies in two steps: a) calculating volume necessary for one of the groups (adults or children or doll) - multiplying 0.44 cubic meters by a/(a+b+c) or b/(a+b+c) or c/(a+b+c) using the assumption 3; and b) dividing the result by the number of people in the group (3, 4, or 1). Since assumption 3 is used, the results contain it: (a/3)/x = (b/4)/y = (c/1)/z = 604.5 kg/ m^3, i.e. it is possible to fill in one cubic meter with 604.5 kg of human tissue from either of the group (adults, children or dolls) or any combination of these groups. Now the author tries to make the same calculation for Holocaust Controversies test group of 3 adults (43 kg each), 4 children (16 kg) and 1 doll (16 kg) using the same 0.44 cubic meter parameter, and this is the mistake. Using the author's own assumption 3 it was necessary to recalculate 0.44 as (see the short answer) 0.44*209/266 = 0.346 cubic meters necessary for HC group and substitute it in the equations. Then the author would arrive to right answers: x1 = 0.071 (for 43kg adult), y1 = 0.026 (for 16 kg child), z1 = 0.026 (for 16 kg doll). As you can check, these results could be found straight from the simple proportionality (assumption 3): x1 = x*43/58, y1 = y*16/21.25, z1 = z*16/7, where 58, 21.25 and 7 are average weights of adult, child and doll in Provan's group and 43, 16 and 16 are the corresponding parameters for HC group. So, then the volume necessary for 2 adults and 1 child would be 0.169 m^3, and 21310 cubic meters of graves would accommodate ~380 000 people. Provan's experiment gives us 266kg in 0.44 m^3 -> we have parameter ro = 604.5 kg/m^3. This is the density of human tissue plus air in the graves (human tissue alone has about 1000 kg/m^3 density, close to that of water). HC group contains 2 adults of 43kg each and 1 child of 16kg. Average body weight - m = 34 kg. Then 1 m^3 can accommodate ro/m = 17.8 people, and 21310 m^3 ~ 380000. While Dmitry's explanation completes the debunking of ST's mathematical blunder, it also refutes my calculation results based on the more rudimentary method applied by Carlo Mattogno (19.51 corpses with an average weight of 34 kg per cubic meter, 415,758 such corpses in 21,310 cubic meters of grave space, see pages 418 and 419 of the critique). I can live with the result of Dmitry's calculations. 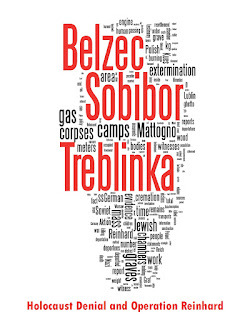 It doesn't change the fact that it would have been more than possible to accommodate the bodies of 434,508 people deported to Bełżec, during the period of the camp's killing operations, in the mass graves discovered by Prof. Andrzej Kola in 1997-1999. 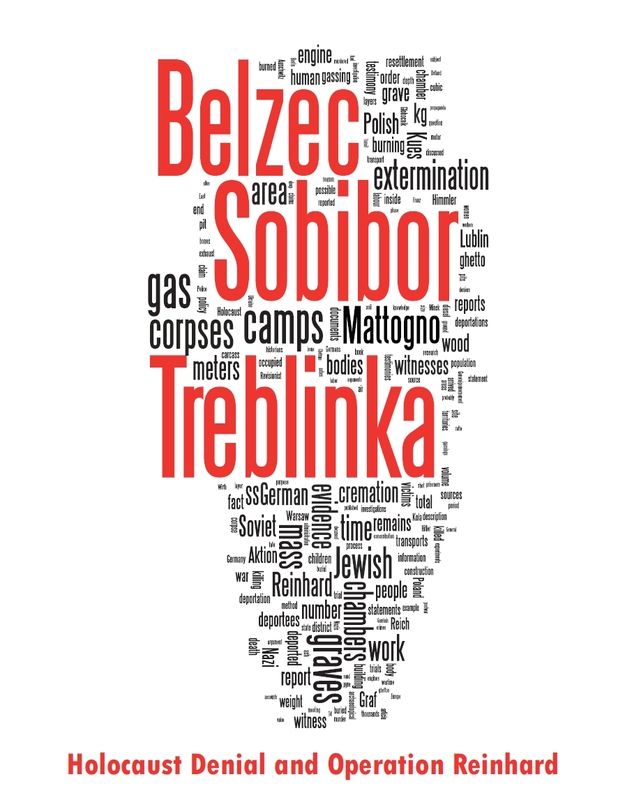 I say "would have been" because these graves, as is suggested by Alex Bay's air photo analysis, were not necessarily the only mass graves at Bełżec extermination camp. Update, 03.06.2012: ST keeps on trying. See my reply to his latest post in post # 2324 on the mentioned JREF forum thread. "Assuming that the average weight of adult Jews in Polish ghettos at the time was in between the upper and the lower value of what the BMI table considers underweight, it would be (38+48) ÷ 2 = 43 kg. " That is nonsense. The adults from the photos below look much more than 43 kg body weight. This remark is followed by a long litany of photographs showing ghetto adults (none from the ghettos from which people were deported to Bełżec, unless I missed something) that supposedly weigh more than 43 kg according to "trevor"'s worthy (and unsubstantiated) opinion. Apart from the fact that his photos show quite a few people who look underweight to me, what the genius forgets is that the 43 kg (just 6 kg below what the BMI still considers normal weight for an adult 1.60 meters tall) are an assumed average weight for ghetto populations in which some were better off than the average whereas the overwhelming majority was malnourished, often down to starvation level. What the genius also forgets is that, when it came to deporting people to places like Bełżec, the Nazis first took away mostly the children, the elderly and those young adults that were not in a comparatively good shape, and left behind those who were in a comparatively good shape, as these could be used to work for the German war industry. Thus it would be no susprise if, for instance, Jews captured during the Warsaw Uprising of 1943 were better fed than would correspond to the mid-value of the BMI table's "underweight" range. Those Warsaw Jews usually ended up at Majdanek and not at Treblinka (where bodies were being burned right away at that time) let alone Bełżec (which had been closed down months before). In addition to the above, according to ethnological studies done by Dr. Otto Von Verschuer, the Jews of Poland were about three inches shorter than the average German.25 This comparative smallness is confirmed by other authorities, notably John R. Baker and Lothrop Stoddard.26 Since Jews are smaller, this would probably reduce their cubic volume by approximately 5%, when compared to non-Jews of European descent, the ethnic background of all the people in my experiment. If you go through all the photos, you will surely find some emaciated inhabitants of ghettos, just like some obese ones. Majority of ghetto inhabitants are neither emaciated nor obese. They are certainly more than 43 kg. The Jewish community of Poland was dying. In the last prewar year, 1938, the monthly average death rate of Łódź was 0.09 percent. In 1941, the rate jumped to 0.63 percent, and during the first six months of 1942 it was 1.49. The same pattern, compressed into a single year, may be noted for the Warsaw ghetto, where the monthly death rate during the first half of 1941 was 0.63, and in the second half 1.47. In their rise to this plateau, the two cities were almost alike, even though Łódź was a hermetically closed ghetto, which had its own currency and in which the black market was essentially the product of internal barter, whereas Warsaw was engaged in extensive smuggling "quietly tolerated" by the Germans. The birthrates in both cities were extremely low: Łódź had one birth for every twenty deaths, while in Warsaw at the beginning of 1942 the ratio was 1:45. The implication of these figures is quite clear. A population with a net loss of one percent a month shrinks to less than five percent of its original size in just twenty-four years. In absolute figures the long lasting Łódź ghetto, with a cumulative population (including new arrivals and births) of about 200,000, had more than 45,000 dead. The Warsaw Ghetto, with around 470,000 inhabitants over the period from the end of 1941 to the end of the mass deportations in September 1942, buried 83,000 people. The photos taken in the Warsaw ghetto by German soldier Heinz Joest in autumn 1941 (collection starts here) were obviously quite representative of ghetto life. A lot of what is written in that HC diatribe is cut and paste from other peoples websites. How come none of the other CODOH clowns ever asks Carmelo to provide examples of the supposed "cut and paste from other peoples websites" in the HC critique of Mattogno, Graf and Kues? Update, 13.06.2012: See posts nos. 2402, , 2404, 2405, 2406, 2407 and 2408 on the JREF forum thread "General Holocaust Denial Discussion Part II". Since I'm the author of that letter Roberto cited here, I would like to make 2 clarifications. where x, y and z are average volumes necessary for an average adult, child or doll; a, b and c are summary weights of all adults, children and doll; 3, 4 and 1 - numbers of people in the corresponding groups, and 0.44 m^3 - volume they all occupied in Provan's experiment. Indeed, a/(a+b+c)*0.44/3 = (a/3)/(a+b+c)*0.44 is the multiplication of the total volume 0.44 m^3 by the ratio between the average adult mass (a/3) and the total Provan's group mass (a+b+c). When Snake Tongue equates average volume x necessary for an average adult body to a/(a+b+c)*0.44/3, he/she actually states that this average volume x is proportional to body mass (a/3). Then he/she repeats the procedure for children and doll groups. Or there could be another way: as I wrote in my letter, a/(a+b+c)*0.44 is the volume occupied by all adults, and dividing it by the number of adults n=3 gives Snake Tongue average volume necessary for an average adult body. But in order to write this down, namely that a/(a+b+c)*0.44 is the volume occupied by all adults, Snake Tongue needs proportionality between this necessary volume for adults and the group mass a. "The method is deceitful because induce the reader to believe the human body volume variation is absolute proportional to the body mass variation". Snake Tongue tries simultaneously to use a method and to prohibit the same method to be used by the others. Second, concerning the difference between the result of the calculations, namely ~380 000 people for the capacity of the graves, and 434 508 people deported to Belzec. Actually, the problem here is in insufficient accuracy of this 380 000 figure. Indeed, this calculation is based on Provan's experiment where people were in clothes and still were able to breath normally. Therefore, parameter ro = 604.5 kg/m^3 is not at it's maximum possible. Average body mass 34 kg was calculated in the assumption of 2 adults + 1 child scenario, but we don't know the exact ratio of children among the deportees. Average adult body mass was calculated as average between the borders of "underweight" group in BMI table. In my opinion this is a good and quite conservative assumption, but we don't know exactly what is the deviation between this assumption and the real average mass. The same can be applied for average child body mass. Finally, none of the parameters used in the calculations is reliable, but all of them are approximations with different accuracies. During the calculations deviations between the "real" values of the parameters and our approximations are multiplied, therefore the final result, 380 000 people, just gives us the order of magnitude. In science it is not sufficient to find a result, it is also necessary to estimate it's error (due to measurements errors, processing errors, etc). In my opinion, the error of 380 000 result is much higher than the difference between 434 508 and 380 000 figures (14% difference). In other words, we cannot accurately distinguish 380 000 figure from the 434 508 one. Very well discussed and very impressive blog,thanks for sharing,I am here to share a simple definition of Rational number as-A number that can be written as a simple fraction known as A rational number(i.e. as a ratio). I wasn't sure where I could share these, but this seems like a good place. Basically, the authors of the articles used the same method as Charles Provan when they tried to calculate the number of people who protested at Tahrir Square last year. That is, they got the total area of Tahrir square, and the side streets leading up to it, and divided it by the population density. The Wired article points out that the method was quite popular back in the sixties. A shame Provan's not with us anymore; these pretty much validate his method. They would've been great footnotes to his article.